Unless you were living under a rock cake all week, you’d know that Mary Berry – host of the beloved Great British Bake Off has left the programme, after it was announced that Channel 4 secured the rights to the show. Also quitting are presenters Mel Giedroyc and Sue Perkins, saying that they were not “going with the dough” – a typically BakeOffian pun. 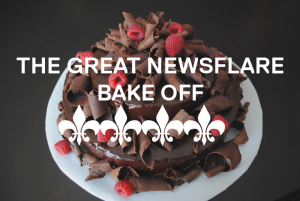 Newsflare is full of awesome baking videos that will keep you entertained for hours on end. If you’re wanting some inspiration, then check out this roundup of the best baking-related clips in our archive. Newsflare member and tech junkie TechRax celebrated his birthday in style this year with a massive 500 pound iPhone cake. In tribute to his obsession with testing the durability of smartphones, a friend was given the enviable task of jumping face-first into the structure, before taking a cheeky nibble. The iPhone cake comes complete with edible apps, realistic buttons, and some solid density that will leave you wondering how much blood, sweat, and tears were involved in its production. If you haven’t yet heard of Ben Churchill, then now is the perfect time. Some say he is the next Paul Hollywood, others that he gives Heston Blumenthal a run for his money. And it only takes a quick look at his incredibly realistic carrot cake to see why. I can already imagine the kind of sticky orange mess that would result if someone less handy with a spatula like me attempted this epic feat of bakery. But the delicacy with which the carrot, rock, and flower pot have been produced is true artistry. Search the hashtag #foodyourillusion, and see all the other outstanding pieces that Ben has created! It will leave you all with soggy bottoms. If this toddler is anything to go by, the future of baking is very bright. In this video, the apron-clad 16-month-old can be seen cracking an egg and emptying its contents into a bowl without batting an eyelid. “Wow!” exclaims her dad, and the internet echoed his astonishment to the tune of 4 million Youtube views and huge interest from all major websites and broadcasters. If you are an expert baker, or even if you just like to ‘attempt’ ambitious baking projects, we’re always on the lookout for amazing videos. So be sure to upload your footage to our website!